8x8 Sheds - Who has the best? 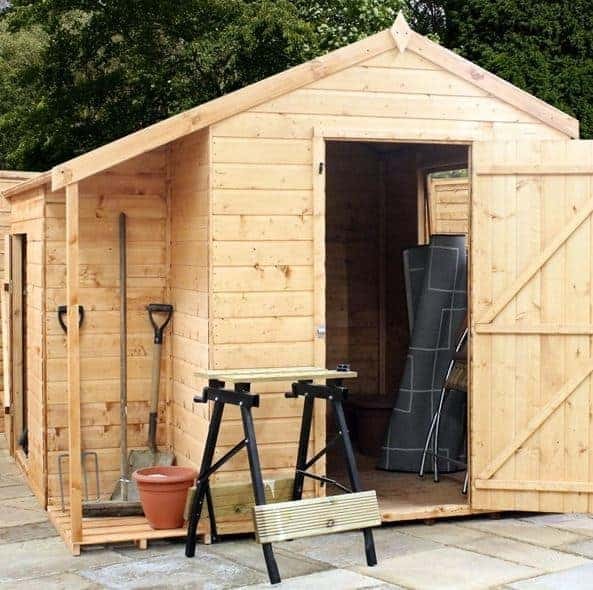 Increasing numbers of people are finding that 8×8 sheds are just perfect for their garden, as they provide a mid sized storage solution without looking too obtrusive or taking up too much room in the garden. 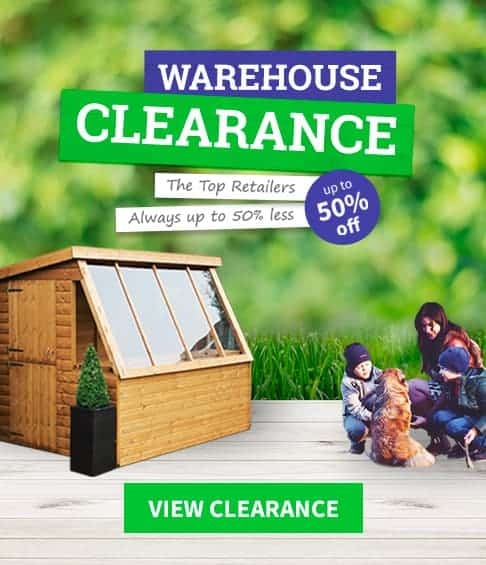 They can also be much more affordable than their larger cousins of course, whilst still providing enough room to store a lawn mower or two and a large selection of gardening tools and equipment. 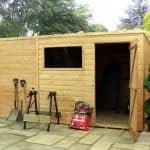 The very best 8×8 sheds can even be used as a small scale workshop to carry out a hobby or business activity, but with so many to choose from it can be hard to find which one is ideal for your particular needs. That’s why we’ve compiled this handy WhatShed guide to the top 20 8×8 sheds currently available to buy online in the UK. With so many sheds to choose from in this category, narrowing it down to a top 20 was a difficult task, but we managed it by considering a number of important factors. These included price, or even more importantly value for money, as well as their durability and any warranty period, and also the style and appearance of the shed. Taking all of this and more into consideration has allowed us to ascertain what really are the top 20 8×8 sheds that can be bought online in the UK today. 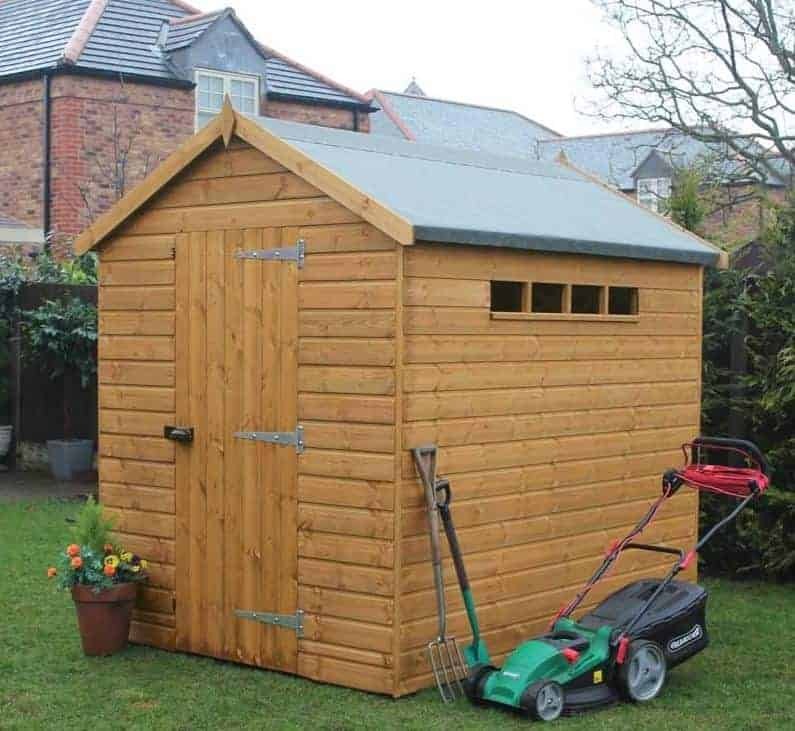 It’s congratulations then to the Strongman tanalised apex shed whose combination of toughness and durability earned it the number one position in our league table of 8×8 sheds. Its price of more than a thousand pounds may put it beyond the reach of some people, but we were pleased that our list contains high quality 8×8 sheds to suit all budgets. Whether you’re looking to buy a mid sized shed, or a large summer house, WhatShed bring you the in depth and impartial reviews that can help you make the perfect purchasing decision. High quality 8×8 sheds can be found at a range of different prices, and we’ve tried to represent that within our top 20 league table, but the very top spot is taken by one of the more expensive sheds on the list. Even so, with its strength and durability we still feel it represents very good value for money. One feature we particularly liked about it is that it has been treated with Tanalith-E which is a high performance preservative treatment that gets deep into the heart of the wood. This means that the shed has long lasting protection without the customer having to add their own treatments, and it comes with a very reassuring 15 year warranty as well. 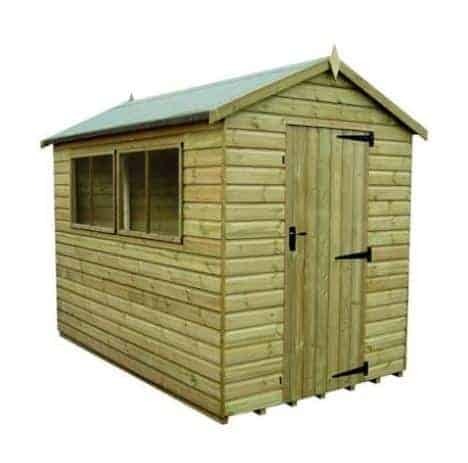 Style wise, this is a traditional looking apex roofed shed with tongue and groove cladding and two opening windows on the side. It was noticeable however that both the cladding and the timber frame were considerably thicker than we usually see on the 8×8 sheds we review, and this makes it a very strong and stable structure. We also liked the mortice lock which is supplied as standard, and the combination of all of these elements carries this Strongman shed to the very top of our 8×8 shed league table. Whilst all of the 8×8 sheds in our top 20 league table share approximately the same base area, they can take on very different appearances. 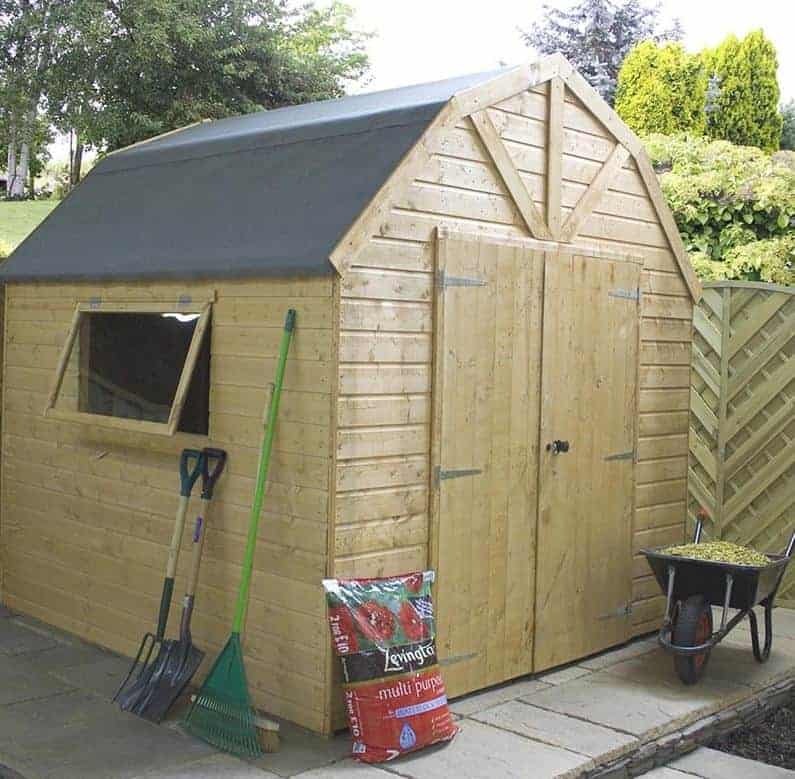 This shed has a look of its very own, and it’s one that we found very attractive and which, when taking into consideration its other features as well, gains it the runner up position in our list. Stylistically it has a Dutch barn design which is a real continental classic but less often seen in the UK. The most noticeable difference is the four sided apex roof, which not only does a good job in channelling rainwater away, it also turns your shed into a good looking garden feature. One of the other advantages of a Dutch barn roof, and the thing that stood out for us at first sight, is that it’s very tall, reaching up to a ridge height of 2.62m. This means that there’s lots of room to store things in, and lots of room to move about in. We were also pleased to find that 12mm thick tongue and groove cladding had been used throughout, and not just for the walls as we sometimes see in the 8×8 sheds we review. If you’re looking for a good looking shed that’s also very spacious and that’s available at a reasonable price too, this could be the ideal choice for you. 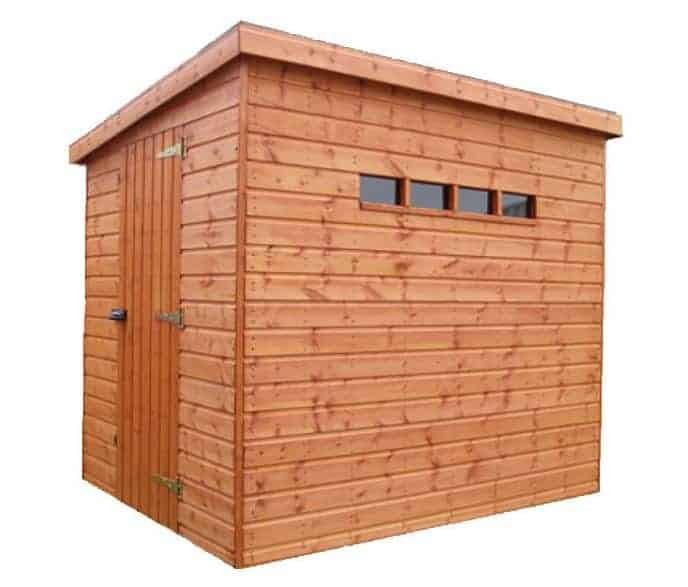 A well built garden shed can transform your garden, making gardening an easier and more pleasurable experience. They’re even better when they come with value adding features as well, such as this visually pleasing example that combines two garden buildings in one and in this way climbs into the top three of our list of the best 8×8 sheds. 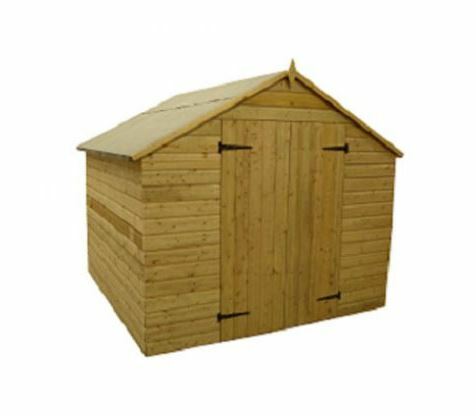 As well as being a sturdy apex roofed shed in its own right it also has a secure store at the rear, as well as a canopy covered area that is ideal for storing logs and firewood. With log burning stoves becoming increasingly popular, this could be a smart money saving storage choice. There is a large single hinged door at the front of the shed, and then a slightly smaller door at the side that leads into the store. Because this area has no windows looking into it, unlike the main shed itself which has one large styrene window, there is no way that passers by to see what’s kept inside. This makes it an ideal place to store items of value, particularly if a padlock is added to heighten the security still further. With tongue and groove cladding used throughout, and a 10 year manufacturer’s guarantee, this is one of the best value 8×8 sheds that we’ve reviewed. 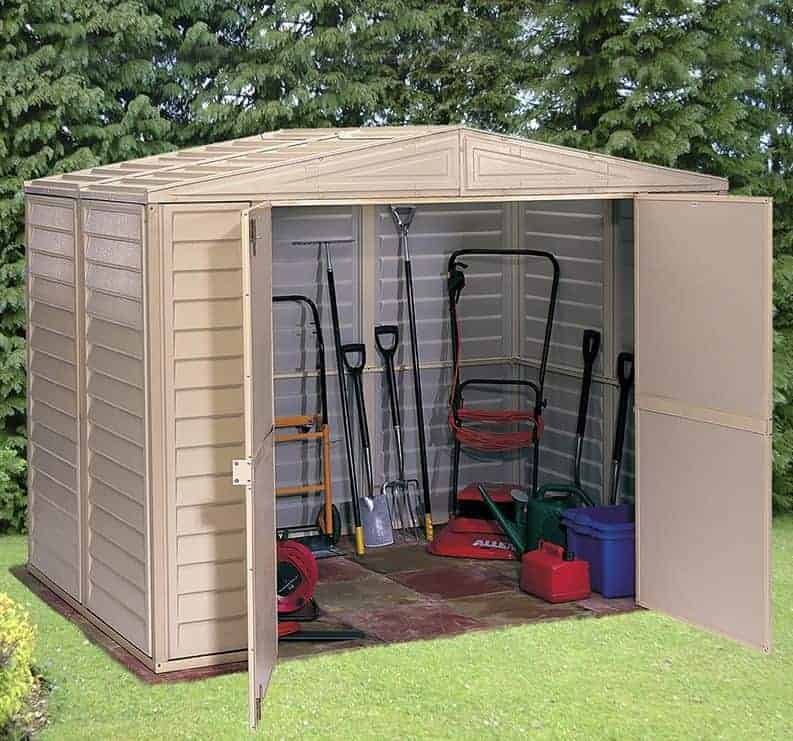 One of the advantages of 8×8 sheds is that they can store a large amount of gardening tools and equipment inside, rather than being limited to a lawn mower and not much else as you can find with compact sheds, but that of course can also make them a target for shed thieves. That’s why security is one of the most important features of a shed today, and it’s a factor that this Empire shed takes very seriously. It takes a classic rectangular apex shed design, but has no windows whatsoever. This means that you’ll need to have an artificial source of lighting inside, but it also means that it’s much less likely to be targeted by opportune thieves as they’ll be unable to see if anything valuable is kept inside. Tongue and groove cladding allied to a heavy duty frame has been used for the walls, although more cost effective OSB sheeting has been used for the floor and roof. We were pleased to find that the timber had been pressure treated, which we don’t always see in a wooden shed as affordable as this one, and that it comes with a 10 year warranty against rot. We wouldn’t be surprised to see it far outlast its warranty period without any problems, and this in combination with its window free design and very accommodating double doors makes this one of the best 8×8 sheds for people who are particularly security conscious. This is the first metal shed to make our guide to the very best 8×8 sheds available to buy online in the UK today, and yet it shouldn’t be discounted by those who don’t like the idea of having anything too metallic looking in their garden. 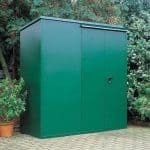 We often see metal sheds that utilise a green and white colour scheme, but this one uses a uniquely dark shade of green, and we found it had quite a striking appearance that blends in well with a garden background. Being made of metal there’s also no need to worry about the threat of rot of course, or any need to spend time and money adding preservative treatments. It was good to see that hot dipped galvanised steel had been used for the cladding, as this creates a very strong shed that’s still lightweight and therefore easy to assemble. It comes with a 10 year guarantee, but it’s a testament to how effective and reliable substrate actually is that we would have liked to see this extended even further. There are no windows, meaning that with the low cost addition of a padlock this could be one of the most secure 8×8 sheds we’ve seen, but there are two vents built into the gables, which comes in particularly useful on warmer days. This is a truly unique building among our top 20 8×8 sheds, in that it combines both a traditional timber storage shed with a handy and well built greenhouse. This not only makes it a highly useful building for those with green fingers, and available at a very reasonable price too, it’s also one of the most attractive garden buildings that we’ve seen as well, with its combination of smooth planed tongue and groove cladding and an elegant glass front. The greenhouse itself is beautifully constructed, and as well as its own door has an opening window in the roof for ventilation purposes. The shed section too has two large windows allowing the owner not only to look out onto the plants growing in their greenhouse, but beyond that and out to the garden itself. It was reassuring to find that all the glazing used was styrene, which is tough and shatter resistant, and that the building is covered by a 10 year manufacturer’s guarantee against rot. The only thing that stops this shed and greenhouse combination from climbing to the very top of our 8×8 sheds list is that the interior storage space of the shed itself is limited by the space given up to the greenhouse section alongside it. BillyOh make high quality sheds in a wide range of sizes, and we were impressed by both the appearance and performance of this eight foot by eight foot model. 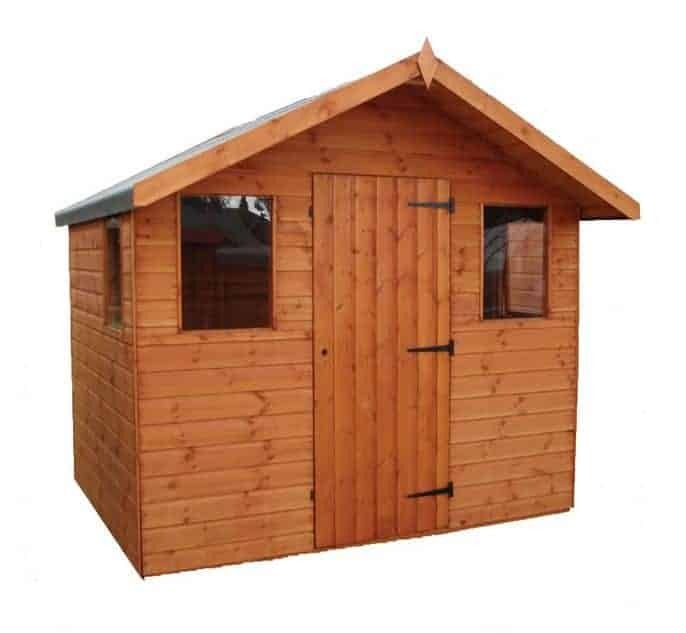 The only reason that it doesn’t feature higher up our list of the very best 8 by 8 sheds is it’s lack of pressure treatment and its lack of a long extended warranty, so this does place an emphasis on the customer to add an annual preservative treatment themselves. Nevertheless, even taking into account the expense of buying this preservative treatment and the cost of adding a floor to the building which is available as an optional extra, we do feel that this represents good value for money at a very affordable price. The felt covered apex roof is very good at carrying water away, so the contents of the shed will be kept dry, and the tongue and groove cladding also stops water penetration by locking tightly together. What we particularly liked about this shed is its bank of four fixed windows that run the whole length of one side; this means that there’s lots of natural light inside the shed, which we feel makes it a low cost option for people who are looking for small scale workshops as well as those looking for 8×8 sheds. This is the highest placed plastic shed in our league table, and it’s only the plastic appearance that prevents it from being ranked among the top 8×8 sheds that we’ve reviewed. Even so, the white cladding which has been designed to give a shiplap wood effect, and the contrasting grey double doors and black apex roof, which reaches up to a very impressive height of 2.43m, is quite striking visually, although we appreciate it won’t be to everyone’s taste. If you haven’t had a plastic shed before, then they bring considerable advantages in that they won’t rot or rust, which means that they’re maintenance free. A 10 year warranty is provided by the manufacturer, but we feel this could have been considerably longer. The thing we liked most about this strong resin shed is that there’s lots of natural light inside. That comes partly from the one side window, but also from an integral skylight positioned in the roof. This makes it an ideal location to carry out a hobby in, or even a small scale business operation. There are also two shelves included as standard, which is something we very rarely see on the 8×8 sheds we review, and a value adding feature that we really welcomed. 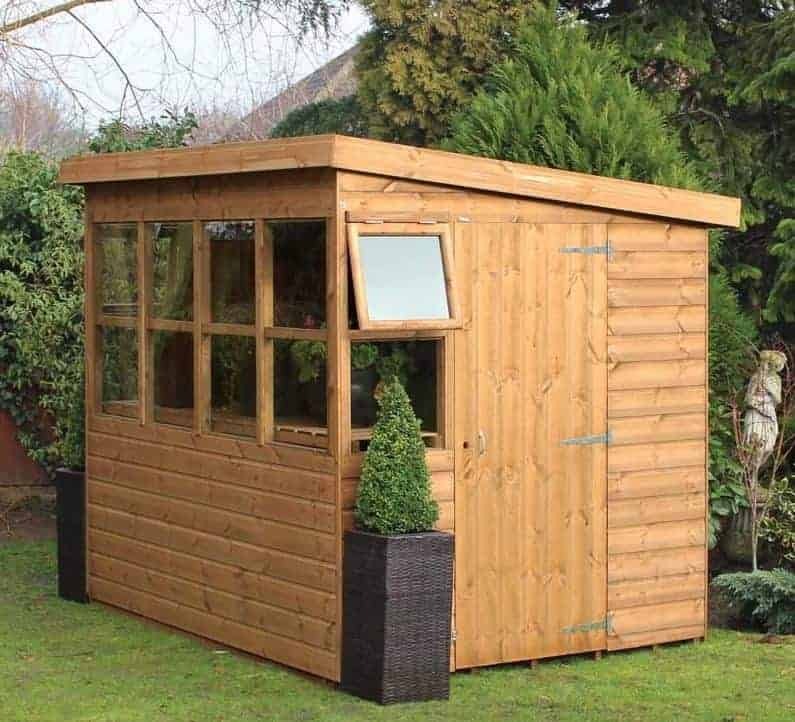 This is a very traditional looking garden shed, with a rectangular design, a bank of windows, and a felt covered apex roof which gives a peak height of 2.35m which makes it the tallest in the BillyOh range of 8×8 sheds. What lifts it above many of its competitors however is that it combines its classic good looks with the latest manufacturing techniques, which is why it has premium quality tongue and groove cladding that’s covered by a 10 year guarantee against wet rot. It also has a stronger than average frame, and this is a factor that can prove especially important if you plan on having the shed located in an exposed area that can be subject to high winds. We also liked the wide opening double hinged doors, which open out to 1.17m and make it very easy to move wide and bulky items inside. It could even be possible to move furniture inside and use this as a home office or additional living space. One area that we feel could have been improved on is the floor, as no floor is provided as standard although a solid sheet floor can be added for £62 or a tongue and groove floor for £82. 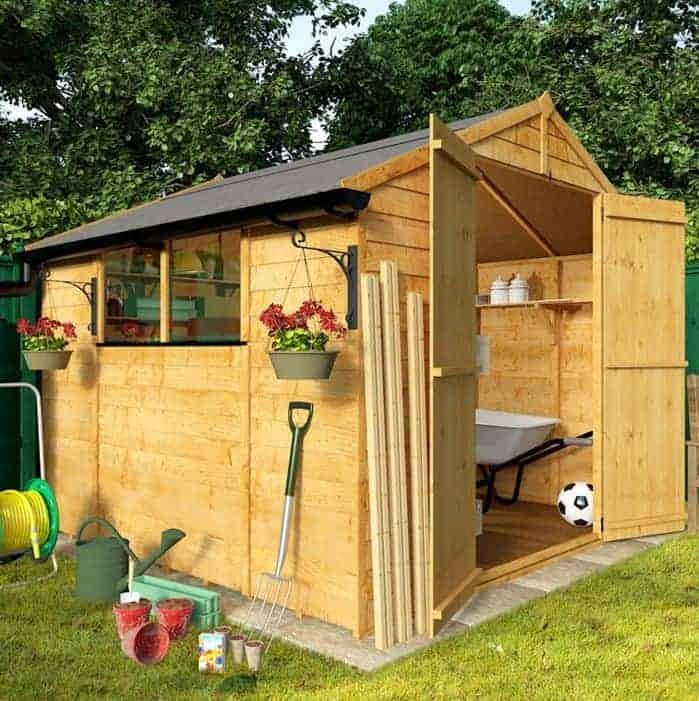 Even so this represents good value for money, and this is a tough garden building that deserves to be in our top 10 8×8 sheds. 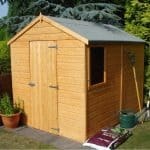 When compiling this list of the 20 best 8×8 sheds that can be bought online in the UK today, we were careful to differentiate garden sheds from log cabins and summer houses. This building, however, does make our list despite being billed as a cabin by the manufacturer, as owing to its use of tongue and groove cladding and its overall design and dimensions we feel it meets the shed classification. The aforesaid cladding, however, is this shed’s stand out feature, as with a thickness of 19mm it’s very strong and reliable. It was good to see as well that the floor and roof were also made of tongue and groove, although in this case they have a more standard thickness of 12mm. Whilst the shed is topped by an apex roof it has a shallower pitch than most, and the result of this is that it has a tall eaves height of 1.91m, or six foot. 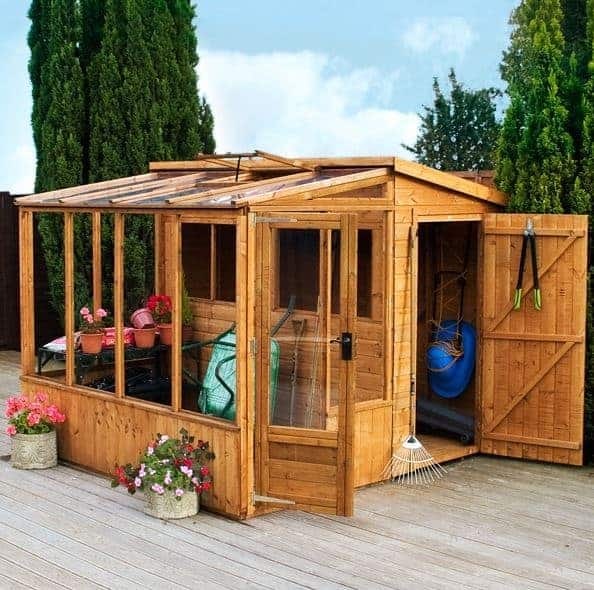 This makes it easy to move around when inside which is an important consideration as 8×8 sheds are large enough to spend time inside rather than simply being a garden storage solution. There’s a 10 year guarantee against rot, but as the shed is supplied untreated the customer themselves has to treat it immediately after installation for the guarantee to remain valid, as well as on an annual basis thereafter. This is the only reason that this sturdy shed isn’t placed much higher up our league table. A garden building that bills itself as the ultimate shed has a lot to live up to, but we certainly found that this well constructed and classically attractive timber shed does have a lot to recommend it. It’s only the price tag which prevents us placing this higher up our list of the very best 8×8 sheds available to buy online today, as value for money is always one of our primary considerations. If this falls within your budget therefore, then you may want to place it higher up in our league table. 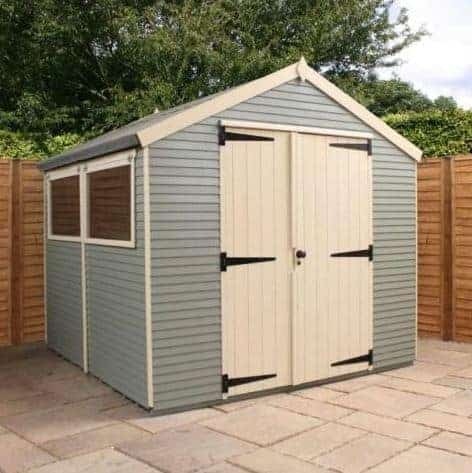 This shed uses tongue and groove cladding throughout, which is something that we often find in the best 8×8 sheds, but in this instance it has a thickness of 16mm rather than the 12mm that we usually see. This makes it a third thicker and stronger, which can be felt in the stability and rigidity once the shed is assembled. It also has a heavy duty frame, and two tough windows that can be opened to allow ventilation in whenever necessary. There’s a secure key operated locking system provided as standard as well, which is something that we always like to see, as well as the extra peace of mind that comes from a 10 year guarantee. 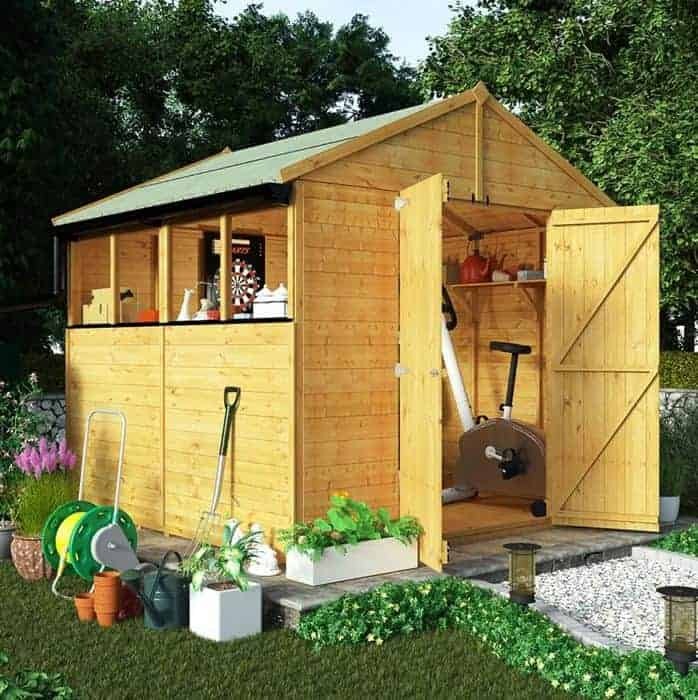 Many people find 8×8 sheds a perfect solution for their garden because of the combination they provide of a good amount of storage space without taking up too much room in the garden itself. Some people may still feel that they just don’t have enough room to accommodate the shed they really want, however, and for them this cleverly designed shed could be an ideal choice. 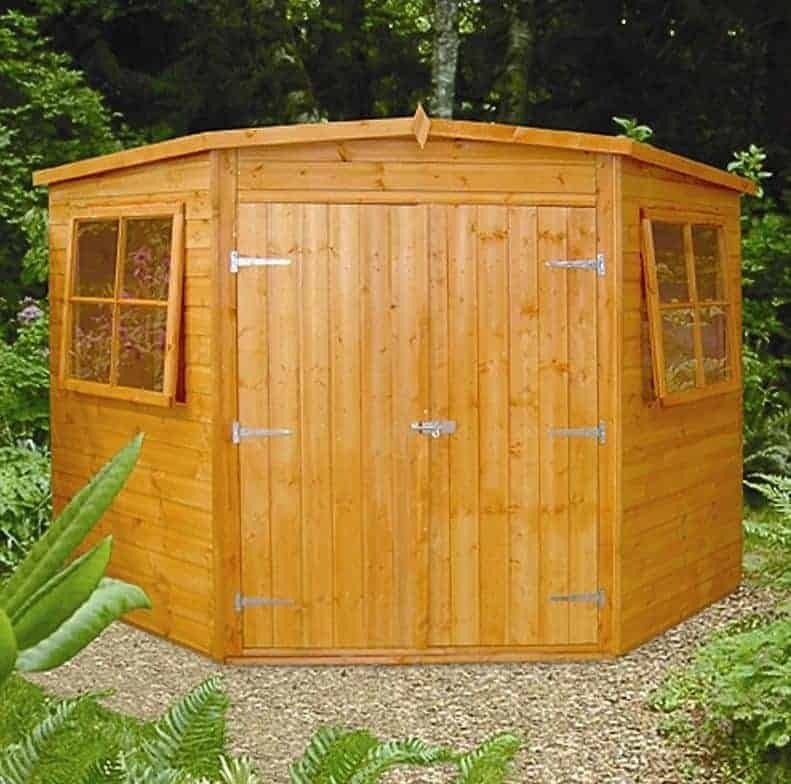 It’s a pentagonal sided corner shed, which means that it fits snugly into the corner of just about any garden. 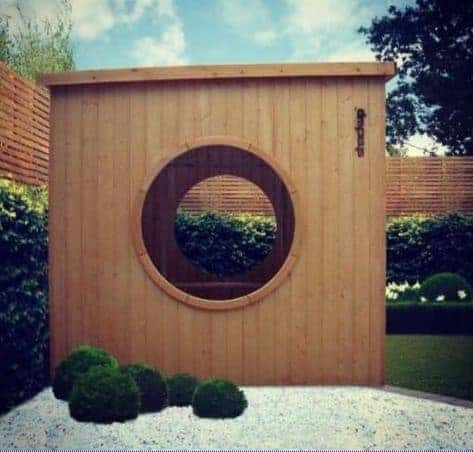 This also means that it loses slightly in the amount of interior space it offers, yet it can still hold more than enough tools and equipment for most small gardens. At the top of the shed sits a pent roof, and whilst this is less obtrusive than an apex roof it still reaches a ridge height of 2.20m and does a very good job of carrying rainwater away, as does the tongue and groove cladding that’s been used throughout. There are two opening windows, one on either side of the large double hinged doors that dominate the front, and so the interior has a light and airy atmosphere that’s ideal to work in. With a 10 year warranty provided as well, this is an inexpensive and for many people a very useful addition to our list of the best 8×8 sheds. 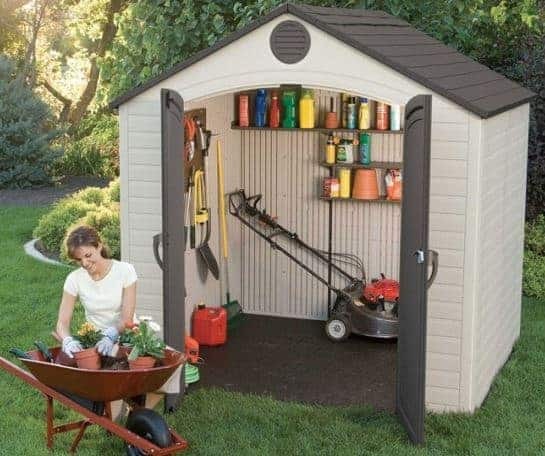 Plastic 8×8 sheds such as this can be a smart choice for people who don’t have the time to carry out maintenance and retreatments. In effect, once this shed has been installed there’s nothing more to do other than hose it down once in a while, a job that’s made more necessary by the use of white coloured polyethylene cladding. The doors and roof are in a contrasting black colour, as is the circular vent above the doors. The double doors themselves are curved at the top, in common with those on the plastic shed at number eight in our list, and it’s a stylistic feature that we really liked. The thing we liked most about this 8×8 shed, however, was that all of the panelling is reinforced with steel bands. This makes the structure very strong and durable, while it still benefits from all the advantages associated with PVC sheds. We wouldn’t be surprised to see it lasting much longer than the 10 year warranty supplied by the manufacturer, and in fact we were a little surprised that the warranty period wasn’t 20 years. Nevertheless, we were very impressed by this garden building, and it’s only the relatively high price that stops it achieving a higher position among our 20 best 8×8 sheds. Garden sheds can be a great place to escape the unpredictable British weather, but that function is aided even further by this shed as the apex roof has a significant overhang that forms a 0.30m canopy. This makes this one of the most versatile wooden 8×8 sheds in our top 20 league table, as this canopy not only provides shade in hot weather and a natural verandah that’s protected from showers, it can even be used as a ideal area to hold a barbecue in summer. 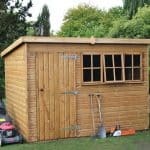 There were many other features that we liked about this shed as well, including its use of tongue and groove across all surfaces, a heavy duty 44 x 34mm frame and a mortice lock to secure valuable items within. We were also pleased to see that there are lots of customisable features that allow the customer to create the shed they really want, which include having tougher glass for the two windows, upgrading to loglap cladding or even having taller eaves. If an extended warranty period had been included as well, and a pressure treatment had been applied to the timbers to give them a long lasting protection, then this building would have featured much higher up this list of the best 8×8 sheds. This unique garden building is the most expensive of the 8×8 sheds that make our WhatShed league table, which accounts for its position towards the foot of the list, and yet it looks like no other shed that we’ve reviewed and we really liked its bold and brave aesthetics. This is a garden shed that’s sure to be noticed and become a talking point, so if you have a very style conscious home that makes the most of contemporary design features this is the perfect garden shed to accompany it. It’s impossible not to be struck by the two large portholes that are on either side of this cuboid pent roofed garden building. They allow you to see straight through from one side to another, and whilst this is certainly spectacular remember that it also puts the contents on view to passers by, so customers need to ensure that a secure locking system is in place too. The double doors have a round motif as well that emulates this porthole design, and the smooth cladding has the word ‘Shack Up’ emblazoned across it. Wayne and Geraldine Hemingway are the designers behind the building, and whilst we would have liked to see a long warranty period as well, this takes the aesthetics designer 8×8 sheds to a new and exciting level. With many people concerned about the security of the items stored within their 8×8 sheds, windowless designs are becoming very popular. This means, however, that there is no natural light inside, but as this very useful timber shed shows there is another solution. At the top of one of the sides, which are interchangeable so that it can fit in with the customer’s own individual garden, are a row of four tiny windows glazed with strong and shatter resistant horticultural glass. Being so small, and positioned so high up on the shed, they don’t allow passers by to see what’s being kept inside and yet they still allow natural light to illuminate the interior. There’s also a padlock protector that further adds to the overall security, although the padlock itself will need to be bought separately. As well as security against intruders there’s also a good level of security against the elements, thanks to the felt covered apex roof that bounces rainwater away, and the interlocking tongue and groove cladding that provides no spaces for water to seep through. The only reason why this very secure building isn’t placed further up our league table of 8×8 sheds is that it comes with just a one year warranty, which we feel could and should be higher. This traditional looking timber shed doesn’t have the style or sophisticated features of some of the other buildings in our list of the top 20 8×8 sheds available to purchase online in the UK today, but it earns its place through the exceptional value it offers. 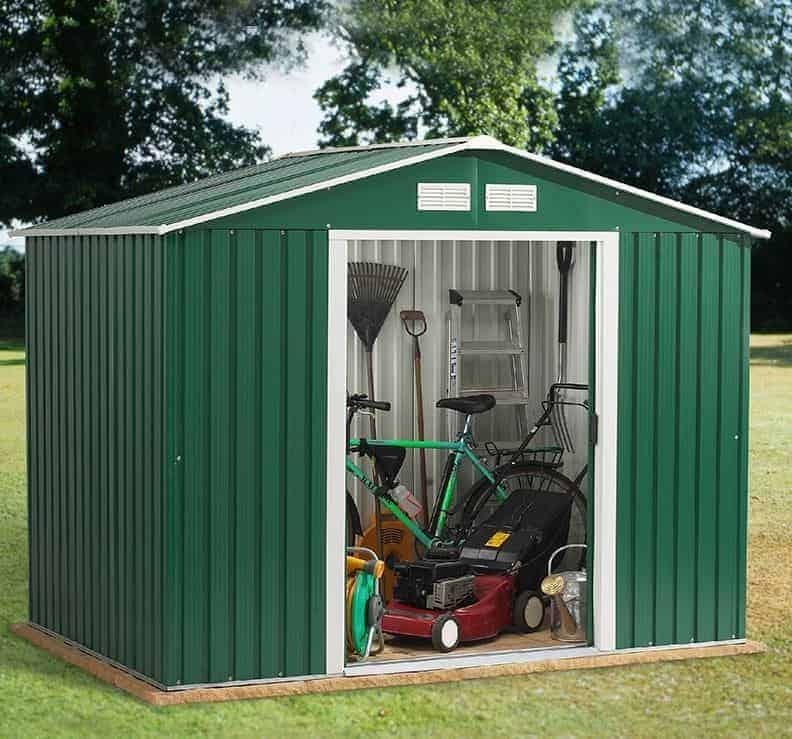 In fact, it’s the cheapest if all the sheds in our league table, and allows those who are operating on a restricted budget to enjoy the advantages that a mid sized storage shed can bring. This shed is the only one in our top 20 to feature overlap cladding, and whilst this isn’t as strong or thick as tongue and groove cladding, it is much more cost effective and this saving has been passed on to the customer as a price of just a little over three hundred pounds shows. Once assembled it feels sturdier than you might think, and there’s even a 10 year guarantee provided as long as annual treatments are kept up. The apex roof too is taller than we would have expected at this price, although the vertical space available is still less than most of the 8×8 sheds we review. It’s also worth noting that no floor is supplied as standard, although two tough windows are. 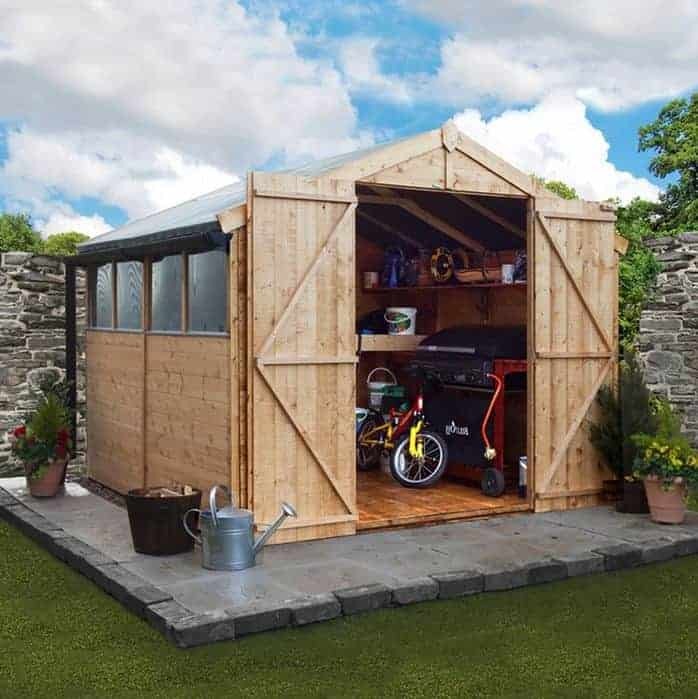 If you want a budget shed that can take a large selection of garden tools, or even bicycles or ride on lawn mowers, then this could be a perfect selection. 8×8 sheds can make an excellent summertime office for people who work from home, but to be used in this way they need to have a plentiful supply of natural light. That’s why this pent roofed shed can be a perfect low cost office option, as well as a stylish and attractive garden shed. The taller side of the shed adjacent to the side bearing the door is dominated by a bank of four large windows, and two other sides have one opening window each. It means that this shed can be both well illuminated and well illuminated, and so it’s a pleasant and welcoming environment to spend time in. The pent roof isn’t the tallest that we’ve seen, giving a ridge height of 1.99m and an eaves height of 1.75m, and we were disappointed to find that only a one year warranty was provided which is the statutory minimum. On the plus side, however, we liked the convenience given by the stable style doors, and it was good to see that high quality PAR tongue and groove cladding had been used, which gives the 12mm cladding the nominal strength of 16mm cladding. We rarely see such high quality timber cladding used on the 8×8 sheds we review, and it’s a very welcome feature. If you want a relatively low cost and no fuss mid sized garden shed then this plastic garden building by Duramax should certainly be on your short list. It’s immune to the effects of rot, rust and insect attack, and is also fire retardant which makes it an ideal place to store flammable paints, oils, or even fuel cans. 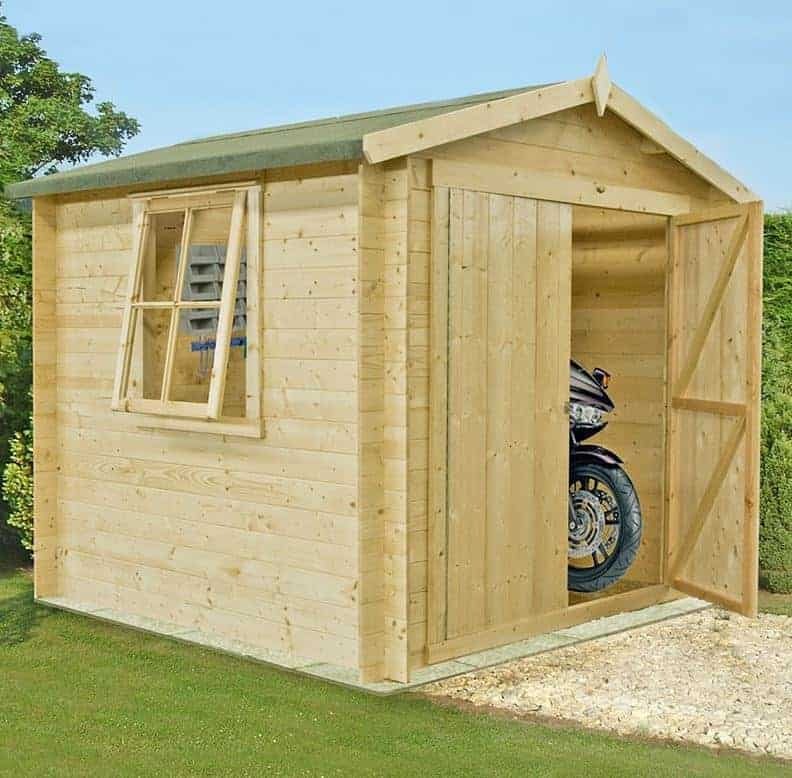 With wide double doors that open out to 1.52m we can also see it being used as an all weather store for a motorcycle or two, something that wouldn’t be advisable with 8×8 sheds made out of timber. Unlike some similar sheds we’ve reviewed, this doesn’t attempt to hide its plastic nature, but we feel that the ivory coloured PVC cladding used will fit in well with properties that already have PVC fascias and soffits, or a white PVC conservatory. 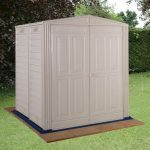 Nevertheless we know that some people dislike a shed that looks too obviously plastic and the fact that the anchor kit which is needed has to be bought as an optional extra, rather than being supplied as standard, is another reason that this is situated in the lower regions of our list of the 20 best 8×8 sheds. Even so, it does represent good value for money, and it should also be more durable than its 10 year warranty suggests. This is the second security shed featuring a row of small windows to make our guide to the best 8×8 sheds available to buy online today. Once again this combines the practicality of a source of natural light for the interior, at the same time as protecting the shed’s contents from prying eyes; after all, a thief is much less likely to try to break into a shed if they can’t be sure if they’ll find anything of value inside. This shed differs from the earlier entry, however, in that it has a pent rather than pent roof and whilst this does take away some head room it can also mean that the shed is less noticeable and obtrusive and is therefore even more secure. It was good to see that 12mm shiplap cladding has been used throughout, as well as very heavy duty framing. There’s also additional framing at one foot intervals, making this one of the strongest and sturdiest 8×8 sheds that we’ve reviewed. 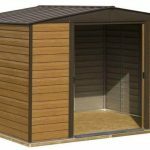 One thing lacking, however, is an extended warranty and it’s significantly more expensive than the apex roofed security shed that we featured earlier. This accounts for its position at the foot of our league table, although it still has a lot of positives to offer, particularly to those who see security as their main priority in a garden shed.